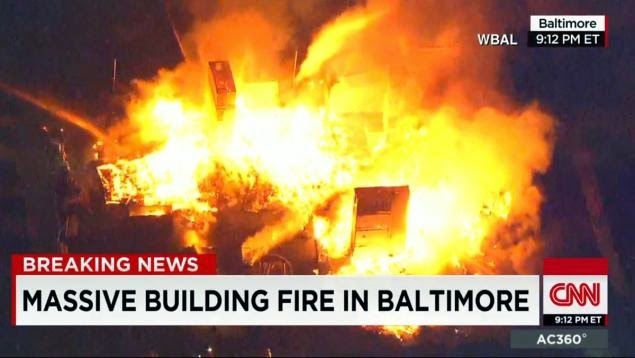 Last night, I watched about an hour of CNN to see what was going on in Baltimore. I did like how police officers and community activists comported themselves when interviewed. However, two of the reporters discussed, without irony, how the constant coverage of rioting and burning after recent incidents starting with Ferguson might be fanning the violence each time. I say without irony because, while everyone spoke, CNN kept running video of fires. Yeah, I'm sure that's helping calm things down. They did this when Ferguson erupted. And in 2001, even the local news had round-the-clock coverage of the riots here in Cincinnati. Yes, my adopted hometown has been through this. That should give you some hope. We got through this. I won't kid you and say everything's fine here, but it's been a lot less heated in Cincinnati for years now than it has been in Baltimore of late. But I also remember how opportunistic the Cincinnati Enquirer was in the months that followed. The normally conservative paper openly turned the police into its personal punching bag. It had less to do with any shortcomings of the police and more to do with selling papers. It did no service to race relations in Cincinnati. The local (and national) media did nothing to resolve the situation, only milked it to sell Toyotas. Eventually, things calmed down. The police made efforts to reach out to the community. It's not all Kumbaya, but there's not this sense of rage that was palpable in the months leading up to the riots. The spark that lit the explosion was the shooting of a Timothy Thomas, a 19-year-old black man, by Officer Stephen Roach. The confrontation? It was over traffic citations. So an unarmed man ran because of traffic tickets. And the officer shot him as he ran away. That was the match tossed into the powder keg. I had a part-time job at a pizza place at the time. Many of my coworkers were high school students from Withrow High School, a predominantly black school. I occasionally gave some of them rides home. One guy, who had moved into assistant management when he graduated, told me he was worried because many of his classmates were getting harassed by cops. Being a pizza delivery guy, I also interacted with a lot of cops. And they were getting frustrated because they did not think they were getting much support from the city. Yeah, tempers were getting ready to blow. It would only take one incident to set off the whole works. When the riots subsided, there was a boycott. There were police reforms. And eventually, peace returned to the city. If Cincinnati can get past it, so can other cities. I'm under no illusion that it can't happen here again. But things go in cycles. If you want the cycle to end, you have to work at it. That's what Cincinnati did. There's no reason other cities can't. Might be nice if the media would help, but that might not sell enough Coca-Cola. Jim, logic doesn't get anywhere when strong emotions come into play. It's like a wildfire on a dry day. I also think you pegged the media correctly when it comes to sensational issues. They fan the flames and then get to report more news. Book Trailers: Friend or Foe?